Tackle ingenious riddles and locate the tome of many secrets. "This is a very sweet combination of the classic Mortimer Beckett games and the Gamehouse style. The story begins in Snuggford and includes a trip around the world for Mortimer with Emily's sister-in-law, Kate O'Malley. Expect the classic brightly colored Gamehouse style and course the hidden mice throughout this not too challenging time-filler." Solve a gripping mystery and tackle ingenious riddles in this Hidden Object adventure. Have you heard about the mysterious Book of Gold? A tome of many secrets, it has already brought an unlikely couple together on a quest to find it — the introverted thinker Mortimer, and the extroverted, spontaneous Kate. But there are many more twists to come. Can you help Mortimer and Kate get their hands on the book? It turns out they are not the only ones who are after it. 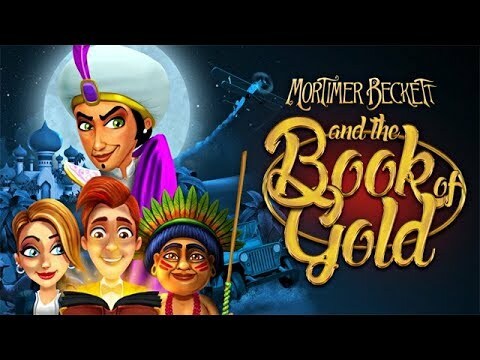 Put your eagle eye to the test, and tease your brain in the beautifully-designed Mortimer Beckett and the Book of Gold. Mortimer Beckett and the Book of Gold is great. It keeps you on your toes and your thinking cap on as quite a lot of mental sussing out is required. When working through the game, you feel a real sense of achievement. All of Mortimer Beckett's games I have played have been nothing but the best games ever. I wish I could afford to buy the whole collection. Whoever made these games keep up the good work. You have my thumbs up and thank you for keeping me entertained. A little confusing but I like it. Would recommend this game to everyone. You just have to pay attention. Locate pairs of matching objects throughout dazzling puzzle boards. Make money selling unused items and create inspired home designs. Join the television cast and examine evidence to solve each case. Upgrade the legendary school of magic from the drawbridge to the dirigible. Defeat a devastating darkness before it destroys mankind.